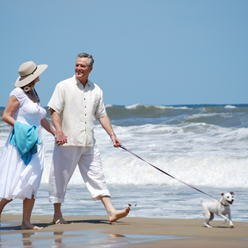 Leashes are required in Corolla, NC; however, there are no length requirements. For more information, contact Currituck County at 252-453-8555. Dogs are allowed on the beaches of Duck, NC unleashed, but as a matter of public safety and courtesy, they should be under the watchful eye and contact of their owner. For more information contact the town of Duck at 252-255-1234. Unfortunately, dogs are not allowed on the beaches of Southern Shores, NC from May 15 – September 15. Southern Shores enforces a year-round leash law. For more information, contact the town of Southern Shores at 252-261-2394. Dogs are allowed on the beaches of Kitty Hawk, NC from the Friday before Memorial Day until the day after Labor Day between the hours of 10:00 AM and 6:00 PM and they must be on a leash no longer than 6′. During other times of the year, dogs are permitted on the beach at anytime but must be restrained on a retractable leash no longer than 12′ long. For more information, contact the town of Kitty Hawk at 252-261-3552. Dogs are allowed on the beaches of Kill Devil Hills, NC from mid-September to mid-May. Dogs aiding the handicapped are allowed year-round. Kill Devil Hills has a year round leash law. For more information, contact the town of Kill Devil Hills 252-480-4000. Dogs are allowed on the beach year-round as long as they are restrained by a leash not exceeding 10 feet. For more information, contact the town of Nags Head 252-441- 5508. Dogs are allowed on the beach year-round if they are restrained with a leash 6 feet or less at all times. All pet waste must be properly disposed of by owners. For more information, contact the National Park Service 252-473-2111.